we're still unpacking around here. still moving in, organizing, decorating. i've moved a lot over the years - to be exact, hank and i have lived in 7 houses including this one, together. we've been dating for a little over 6 years. ha! and every time, we change out a few things. sell some, buy some. this inevitably includes searches on craigslist. and oh, guys, don't you just love and hate craigslist at the same time? and does anyone else wonder what we used before it came out?? i don't look anywhere else...unless i happen to drive by a garage sale on a saturday morning. a lot of times, we resort to just buying new items and in some cases, that's the best move. but this time we scored on two awesome items. and we're sorta super excited about them. our kitchen, living, and dining space is all in one room. we were going to use our dining table as a combo table/counter space but that just got messy. i was feeling yucky and decided we HAD to change it up asap. 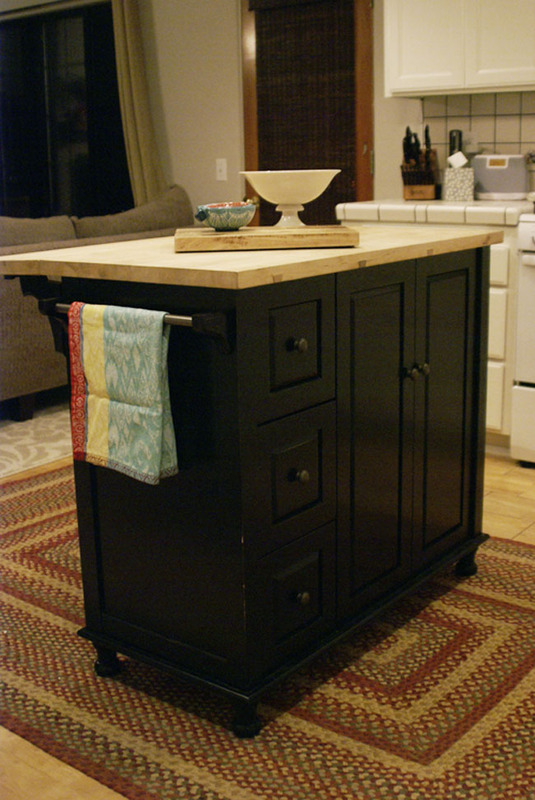 enter the kitchen island solution. it's ideal really. more storage, better on space, and it comes with a butcher block. and who doesn't love a butcher block!? the problem is that they're not cheap and they're hard to find used. but the other day, we came across a post that had just come up on CL and it was perfect! and the gal selling it was nice and responsive and normal! coming across scary people on craigslist might be one of my ridiculous fears. anyhow, this baby was originally $499 from crate and barrel and we got it for $90! and it's in close-to perfect condition. we've already made some pretty stellar sandwiches on that block. currently on the hunt for bar stools, in case you know of any you want to send me. onto our second craigslist gem. again, it was a post that had just come up and i was the first to email! i love when that happens. 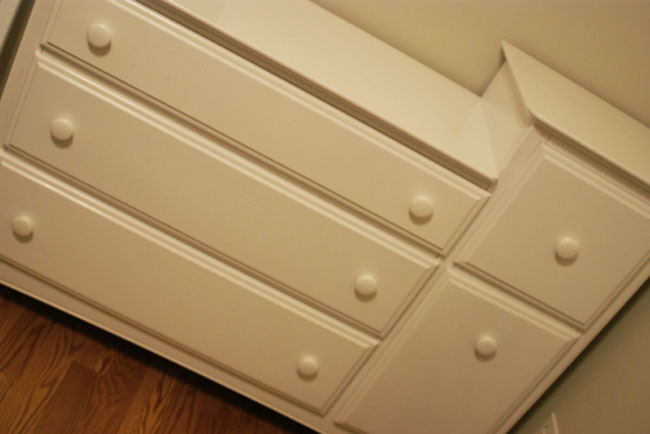 but i happened to see this one with drawers and a cupboard and then, it all of a sudden seemed so useful! storage and a designated spot for some serious dirty work. maaaybe you moms are onto something! and at $100, i'm liable to buy anything. again, almost perfect condition and a nice couple handing it over to us. so things are pretty exciting over here. to prove it, this also happened last night....is there anything sexier? nope, don't think there is. and i know you're all eyeing that adorable quilt. it was handmade for river by a very special person - soon to open her own etsy shop! we LOVE it and soon you can love your very own as well. i'll get ya posted. so there ya go, shopping and building parties. hip hip hooray. Um. You scored, like, hugely. Also, that quilt is adorable!! Send your Craigslist love MY way! 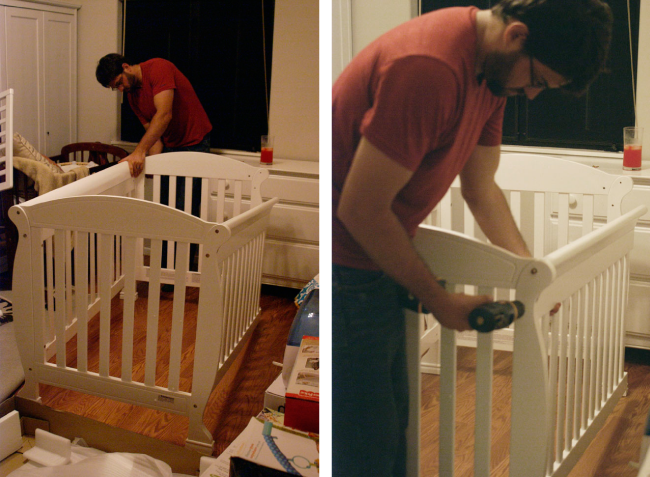 I purchased not one, but two cribs today...meaning I need to sell an old crib and changing table. (You'll be so glad you got one, by the way.) And then a double stroller and a toy box and another dresser. SO. Tell me your ways! I'm diggin' that crib, yes I am. Maybe in like 15 years when I finally have kids, you can hand it down to me? kthanksbai! LOVE THE QUILT!!! and how lucky you were with the Craigslist finds! They are perfect!!! I love that island! You lucky lady!! It looks great! I Love/hate craigslist for sure. What I hate more than buying on Craigslist is selling. There have been some FREAKS. hahaha! Seriously dude, that island is a FIND! Your house looks awesome already! Love your buys! 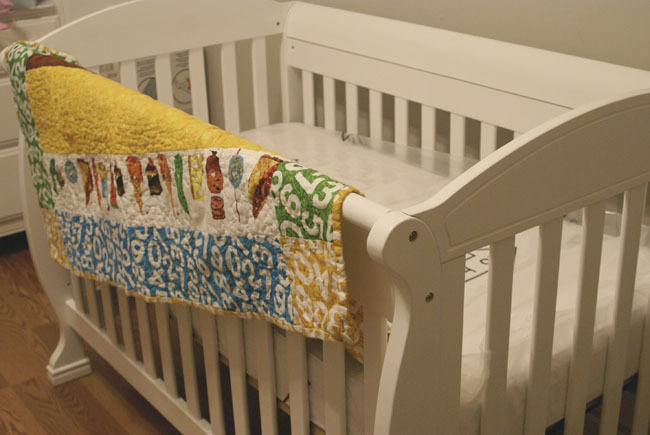 And that quilt... Its got the fabric from The Very Hungry Caterpillar! So cute!! 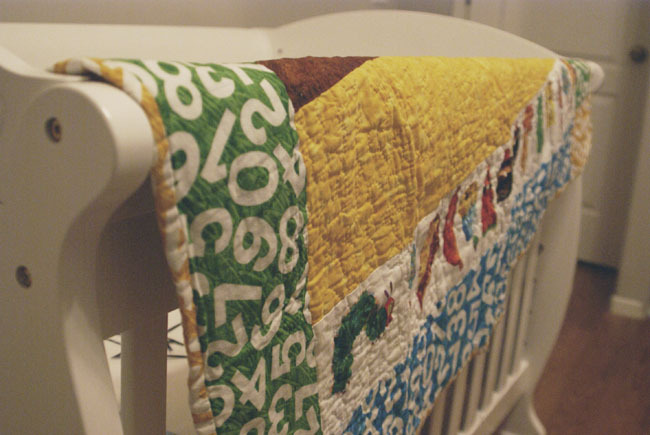 Since I work in family literacy, you had to know I'd be obsessed with that quilt!! Soooooo awesome. i can't wait until we get our cot--so exciting! although we have a long way to go with the "nursery" at the moment it is our dumping room. I love it! I don't think Craigslist is a "thing" over here. Ebay is the pretty standard go-to I'd say. My point is, I WANT AN ISLAND AND A CHANGING TABLE AND A CRIB! I can't wait to see all this loveliness LIVE tomorrow. I'm gonna bring sandwich stuff just to test out your new island. Love the quilt! Ahhhhh! Baby planning! I am so excited for you VIcVay!